For other senses of this word, see Stigma and stigmata (disambiguation). Not to be confused with Stigmatism. Stigmata (singular stigma) is a term used in Christian mysticism to describe the manifestations of bodily wounds, scars and pain in locations corresponding to the crucifixion wounds of Jesus Christ, such as the hands, wrists, and feet. An individual bearing the wounds of stigmata is referred to as a stigmatist or a stigmatic. Stigmata are primarily associated with the Roman Catholic faith. Many reported stigmatics are members of Catholic religious orders. St. Francis of Assisi was the first recorded stigmatic in Christian history. For over fifty years, St. Padre Pio of Pietrelcina of the Order of Friars Minor Capuchin reported stigmata which were studied by several 20th-century physicians. Stigmata is notably foreign to the Eastern Orthodox Church, given that the first and only stigmatics have been Catholics who lived after the Great Schism of 1054, and professes no official view on the matter. A high percentage (perhaps over 80%) of all stigmatics are women. In his Stigmata: A Medieval Phenomenon in a Modern Age, Ted Harrison suggests that there is no single mechanism whereby the marks of stigmata were produced. What is important is that the marks are recognised by others as of religious significance. Most cases of stigmata have been debunked as trickery. Some cases have also included reportings of a mysterious chalice in visions being given to stigmatics to drink from or the feeling of a sharp sword being driven into one's chest. Saint Francis of Assisi contemplating the wounds of stigmata as part of the Imitation of Christ. Reported cases of stigmata take various forms. Many show some or all of five Holy Wounds that were, according to the Bible, inflicted on Jesus during his crucifixion: wounds in the wrists and feet, from nails; and in the side, from a lance. Some stigmatics display wounds to the forehead similar to those caused by the Crown of Thorns. Stigmata as crown of thorns appearing in the 20th century, e.g. on Marie Rose Ferron, have been repeatedly photographed. Other reported forms include tears of blood or sweating blood, and wounds to the back as from scourging. Many stigmata show recurring bleeding that stops and then starts, at times after receiving Holy Communion, and a significant portion of stigmatics have shown a strong desire to frequently receive Holy Communion. A relatively high percentage of stigmatics also exhibit inedia, claiming to live with minimal (or no) food or water for long periods of time, except for the Holy Eucharist. Some exhibit weight loss, and closer investigation often reveals evidence of fakery. Some stigmatics claim to feel the pain of wounds with no external marks; these are referred to as "invisible stigmata". Some stigmatics' wounds do not appear to clot, and seem to stay fresh and uninfected. The blood from the wounds is said, in some cases, to have a pleasant, perfumed odor, known as the Odour of Sanctity. Individuals who have obtained the stigmata are many times described as ecstatics, overwhelmed with emotions upon receiving the stigmata. No case of stigmata is known to have occurred before the thirteenth century. In his paper Hospitality and Pain, Christian theologian Ivan Illich states: "Compassion with Christ... is faith so strong and so deeply incarnate that it leads to the individual embodiment of the contemplated pain." His thesis is that stigmata result from exceptional poignancy of religious faith and desire to associate oneself with the suffering Messiah. St. Francis of Assisi is the first recorded stigmatic in Christian history. In 1224, two years before his death, he embarked on a journey to Mount La Verna for a forty-day fast. One morning near the feast of the Exaltation of the Cross, a six-winged angel reportedly appeared to Francis while he prayed. As the angel approached, Francis could see that the angel was crucified. He was humbled by the sight, and his heart was filled with elation joined by pain and suffering. When the angel departed, Francis was purportedly left with wounds in his hands, feet, and side as if caused by the same lance that pierced Christ’s side. The image of nails immediately appeared in his hands and feet, and the wound in his side often seeped blood. 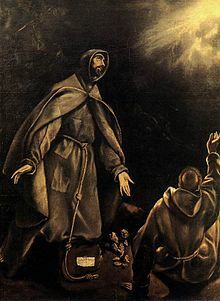 In traditional artistic depictions of the incident, Francis is accompanied by a Franciscan brother. His wrists and feet seemed to be pierced by nails, with the heads of the nails appearing on his wrists and on the upper sides of his feet, the points appearing on the other side. The marks were round on the palm of each hand but elongated on the other side, and small pieces of flesh jutting out from the rest took on the appearance of the nail-ends, bent and driven back. In the same way the marks of nails were impressed on his feet and projected beyond the rest of the flesh. Moreover, his right side had a large wound as if it had been pierced with a spear, and it often bled so that his tunic and trousers were soaked with his sacred blood. From the records of St. Francis' physical ailments and symptoms, Dr. Edward Frederick Hartung concluded in 1935 that he knew what health problems plagued St. Francis. Hartung believed that he had an eye ailment known as trachoma and quartan malaria. Quartan malaria infects the liver, spleen, and stomach, causing the victim intense pain. One complication of quartan malaria occasionally seen around Francis' time is known as purpura, a purple hemorrhage of blood into the skin. According to Hartung "If this were the case of St. Francis, he would have been afflicted by ecchymoses, an exceedingly large purpura. The purple spots of blood may have been punctured while in the wilderness and there appear as an open wound like that of Christ." A later medical hypothesis was proposed in 1987 to explain the wounds, it claimed that St. Francis may have contracted leprosy. 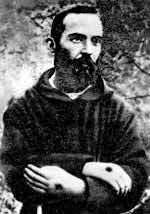 A young Padre Pio showing the stigmata. For over fifty years, Padre Pio of Pietrelcina reported stigmata which were studied by several 20th-century physicians, whose independence from the Church is not known. The observations were reportedly inexplicable and the wounds never became infected. His wounds healed once, but reappeared. The wounds were examined by Luigi Romanelli, chief physician of the City Hospital of Barletta, for about one year. The physician Angelo Maria Merla noted that the wounds were not tubercular in origin but could not make an official diagnosis without further tests. The surgeon Giorgio Festa, a private practitioner, also examined them in 1920 and 1925. Professor Giuseppe Bastianelli, physician to Pope Benedict XV, examined the wounds, but no report of his examinations was made. Pathologist Amico Bignami of the University of Rome also observed the wounds describing them as shallow. Festa who had originally agreed with Bignami later described the wounds as superficial when covered with a scab. Giorgio Festa noted that "at the edges of the lesions, the skin is perfectly normal and does not show any sign of edema, of penetration, or of redness, even when examined with a good magnifying glass". Dr. Alberto Caserta took X-rays of the hands in 1954 and found no abnormality in the bone structure. Dr. Giuseppe Sala who worked as a physician for Pio between 1956-1968 commented that tests revealed his blood had no signs of abnormality. There were both religious and non-religious critics who accused Padre Pio of faking his stigmata, saying he used carbolic acid to make the wounds. The historian Sergio Luzzatto recounted that in 1919, according to one document in the Vatican's archive, Pio had requested carbolic acid from a pharmacist. She said it was for sterilization. Amico Bignami in a report wrote that the wounds were caused by "neurotic necrosis". He suggested they had been inflicted unconsciously by suggestion and artificially maintained by iodine that Pio had used as a disinfectant. In 1922, physician Agostino Gemelli wrote that Pio was a hysteric and his stigmata were self-induced, not of supernatural origin. Gemelli also speculated that his wounds were kept open with carbolic acid. Throughout his life, Pio had hidden his wounds by wearing fingerless gloves. At death there were no wounds, only "unblemished skin". Many stigmatics have been exposed as utilizing trickery. Magdalena de la Cruz for example confessed before she died that her stigmata was deliberate deception. An early neurologist Désiré-Magloire Bourneville published works which stated that saints claiming to produce miracles or stigmata, and those claiming to be possessed were actually suffering from epilepsy or hysteria. Some modern research has indicated stigmata are of hysterical origin or linked to dissociative identity disorder. There is a link between dietary constriction by self-starvation, dissociative mental states and self-mutilation, in the context of a religious belief. Anorexia nervosa cases often display self-mutilation similar to stigmata as part of a ritualistic, obsessive–compulsive disorder. A relationship between starvation and self-mutilation has been reported amongst prisoners of war and during famines. Cases of stigmatism fall into two categories: self-inflicted wounds, which may be either cases of fraud or of unconscious self-infliction, and those that are caused by emotional states... Self-induced (through autosuggestion) itching and subsequent scratching of which the individual is unaware is likely to occur in suggestible persons if the stimulus is a mental or actual picture of the Crucifixion used during meditation and if the main motive is to receive the stigmata. The motive behind that may be unconscious conflict and a desire to escape from an intolerable situation into invalidism where one's needs are taken care of. It then becomes a case of hysterical conversion reaction. Many cases of stigmatism can be explained as fraud or unconsciously self-inflicted wounds. In his Stigmata: A Medieval Phenomenon in a Modern Age, Ted Harrison suggests that there is no single mechanism whereby the marks of stigmata were produced. Harrison found no evidence from a study of contemporary cases that the marks were supernatural in origin. He concluded, however, that marks of natural origin need not be hoaxes. Some stigmatics marked themselves in attempt to suffer with Christ as a form of piety. Others marked themselves accidentally and their marks were noted as stigmata by witnesses. Often marks of human origin produced profound and genuine religious responses. Harrison also noted that the male-to-female ratio of stigmatics, which for many centuries had been of the order of 7 to 1, had changed over the last 100 years to a ratio of 5:4. Appearance of stigmata frequently coincided with times when issues of authority loomed large in the Church. What was significant about stigmatics was not that they were predominantly men, but that they were non-ordained. Having stigmata gave them direct access to the body of Christ without requiring the permission of the Church through the Eucharist. Only in the last century have priests been stigmatized. It has been suggested that rare cases of non self-induced stigmata may be explained by painful bruising syndrome. Skeptical investigator Joe Nickell who has investigated recent cases of stigmata such as Katya Rivas, commented that they are indistinguishable from hoaxing. In 2002, a psychoanalytic study of stigmatic Therese Neumann has suggested that her stigmata resulted from post-traumatic stress symptoms expressed in unconscious self-mutilation through abnormal autosuggestibility. Among the Warao of the Orinoco Delta, a contemplator of tutelary spirits may mystically induce the development of "...(imagined) openings in the palms of his hands." That these tutelary spirits are presented by the "itiriti snake" makes for a close analogue with the Seraph who endowed Francis of Assisi with his stigmata. Buddhist "stigmata" are regularly indicated in Buddhist art. Some spiritualist mediums have also produced stigmata. During the séances of German medium Maria Vollhardt, it was alleged that bleeding wounds appeared. However Albert Moll, a psychiatrist, considered her phenomena to be fraudulent. ^ "Stigmata (Christian Mysticism)". Encyclopedia Britannica. Retrieved 2018-07-03. ^ Jones, C. P. (1987). Stigma: Tattooing & Branding in Graeco-Roman Antiquity. Journal of Roman Studies 77: 139-155. ^ "Manifestations - Questions & Answers". oca.org. ^ a b c Harrison, Ted (October 1994). Stigmata: A Medieval Phenomenon in a Modern Age. St Martins Press. ISBN 978-0-312-11372-8. ^ a b Nickell, Joe. (2004). "The Stigmata of Lilian Bernas". Skeptical Inquirer. Retrieved 12 May 2016. ^ Johann Joseph von Görres (1883). The stigmata, tr. from 'The Mystik', ed. by H. Austin. ^ "Catholic Encyclopedia: Mystical Stigmata". Retrieved 2008-07-02. ^ "What's the deal with stigmata?". The Straight Dope. 1998-02-20. Retrieved 2012-02-27. 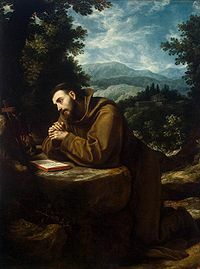 ^ "Stigmata of St. Francis of Assisi". Franciscan Friars T.O.R. Archived from the original on 2012-03-07. Retrieved 2012-02-27. ^ Francis, Henry S. (1963). "Sasseta: crucifixion with St. Francis". The Bulletin of the Cleveland Museum of Art. Cleveland Museum of Art. 50 (3): 46–49. JSTOR 25151940. ^ "Medieval Sourcebook: Thomas of Celano: Lives of St. Francis". Fordham.edu. Retrieved 2012-02-27. ^ a b Hartung, Edward Frederick. (1935). St. Francis and Medieval Medicine. Annals of Medical History 7: 85-91. ^ "Medicine: St. Francis' Stigmata". Time. 1935-03-11. ISSN 0040-781X. Retrieved 2009-09-14. ^ Schazlein, Joanne; Sulmasy, Daniel P. (1987). The Diagnosis of St. Francis: Evidence for Leprosy. Franciscan Studies 47: 181-217. ^ a b "The Stigmatist". Time Magazine. 19 December 1949. Retrieved 2008-01-19. ^ a b "A Padre's Patience". Time Magazine. 24 April 1964. Retrieved 2008-01-19. ^ Marie osb, Dom Antoine (2000-04-24). "Letter on Blessed Pader Pio: Stigmata - Sacraments of Penance and Eucharist - Suffering". Retrieved 2006-09-27. ^ "Padre Pio". Britannica.com. 1968-09-23. Retrieved 2012-02-27. ^ Quote: Maria De Vito said, "I was an admirer of Padre Pio and I met him for the first time on July 31, 1919...he gave me personally an empty bottle, and asked if I would act as a chauffeur to transport it back from Foggia to San Giovanni Rotondo with four grams of pure carbolic acid. ... He explained that the acid was for disinfecting syringes for injections. He also asked for other things, such as Valda pastilles." Moore, Malcolm (2007-10-24). "Italy's Padre Pio 'faked his stigmata with acid'". The Daily Telegraph. Rome. Retrieved 2012-04-25. .
^ "Italy's favourite saint Padre Pio 'used carbolic acid to self-inflict stigmata', claims historian". Retrieved 12 May 2016. ^ Nickell, Joe. (2001). Real-Life X-Files: Investigating the Paranormal. University of Kentucky Press. p. 281. ISBN 0-8131-2210-4 "That many stigmatics were fakes is well established. For example, Magdalena de la Cruz, having become ill in 1543 and fearful of dying a sinner, confessed that her stigmata, inedia, and other phenomena were deliberate deceptions." ^ Seidl, O. (2008). Stigmatisation and Absence of Nutrition in the Case of Therese Neumann (1898-1962). Nervenarzt 79 (7): 836-843. ^ a b Kluger, N; Cribier, B. (2013). Stigmata: From Saint-Francis of Assisi to Idiopathic Haematidrosis. Ann Dermatol Venereol 140: 771-777. ^ Daniel Fessler (2002). "Starvation, serotonin, and symbolism. A psychobiocultural perspective on stigmata" (PDF). Mind and Society: Cognitive Studies in Economics and Social Sciences. 3 (2): 81–96. Retrieved 2009-09-12. ^ Yaryura-Tobias, Jose A.; Fugen A. Neziroglu; Steven Kaplan (1995). "Self-mutilation, anorexia, and dysmenorrhea in obsessive compulsive disorder". International Journal of Eating Disorders. 17 (1): 33–38. doi:10.1002/1098-108X(199501)17:1<33::AID-EAT2260170104>3.0.CO;2-2. PMID 7894450. ^ Curtin, A. P. (1946). "Imprisonment under the Japanese". BMJ. 2 (4476): 585–586. doi:10.1136/bmj.2.4476.585. ISSN 0959-8138. PMC 2054516. PMID 21284113. Retrieved 2009-09-12. ^ University of Minnesota. Laboratory of Physiological Hygiene; Ancel Keys (1950). The Biology of Human Starvation. University of Minnesota Press. ^ Early, Loretta F; Lifschutz, Joseph E. (1974). A Case of Stigmata Loretta. Arch Gen Psychiatry 30 (2):197-200. ^ Ratnoff O, D. (1980). The psychogenic purpuras: A review of autoerythrocyte sensitization, autosensitization to DNA, “hysterical” and factitial bleeding, and the religious stigmata. Semin Hematol 17: 192-213. ^ Panconesi, E., & Hautmann, G. (1995). Stress, Stigmatization and Psychosomatic Purpuras. International Angiology 14: 130-137. ^ Armando De Vincentiis. (2011). "New insights into the phenomenon of Natuzza Evolo". Italian Committee for the Investigation of Claims on the Paranormal. Retrieved 12 May 2016. ^ Albright, M. (2002). "The Stigmata: The Psychological and Ethical Message of the Posttraumatic Sufferer". Psychoanalysis and Contemporary Thought. 25 (3): 329–358. ^ Wolffram, Heather (2012). Trick, Manipulation and Farce: Albert Moll's Critique of Occultism. Medical History 56 (2): 277-295. 56. pp. 277–295. doi:10.1017/mdh.2011.37. PMC 3381525. PMID 23002297. Biot, René. (1962). The Enigma of the Stigmata. Hawthorn Books. Radford, Benjamin. (2014). What is Stigmata?. LiveScience. Retrieved 12 May 2016. Yarom, Nitza. (1992). Body, Blood, and Sexuality: A Psychoanalytic Study of St. Francis' Stigmata and Their Historical Context. Peter Lang Publisher. 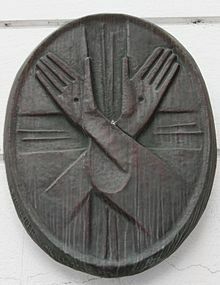 Wikimedia Commons has media related to Stigmata.